[Update 4/5/2013] Click here for an elevation profile and further description of the Lake Tahoe Ironman run course. The paved bike path from Squaw Valley Park to Tahoe City provides 5 picturesque miles of flat trail alongside the Truckee River. The partially shaded trail is well-separated from Highway 89, and crosses over and under the highway or river several times. There is a dirt running shoulder for about half of the distance. This popular path connects with a number of other paths to provide plenty of miles for out-and-back marathon training runs, including a 20-mile route with spectacular Lake Tahoe views (see Route Variations below). Numerous family recreational opportunities exist at either end of the path. Squaw Valley Park has fun play structures, a large synthetic turf soccer field and pickle ball courts. On the Tahoe City side, Commons Beach offers access to Lake Tahoe, a playground for the kids, and is home to the Foothills Famers’ Market on Thursday mornings. 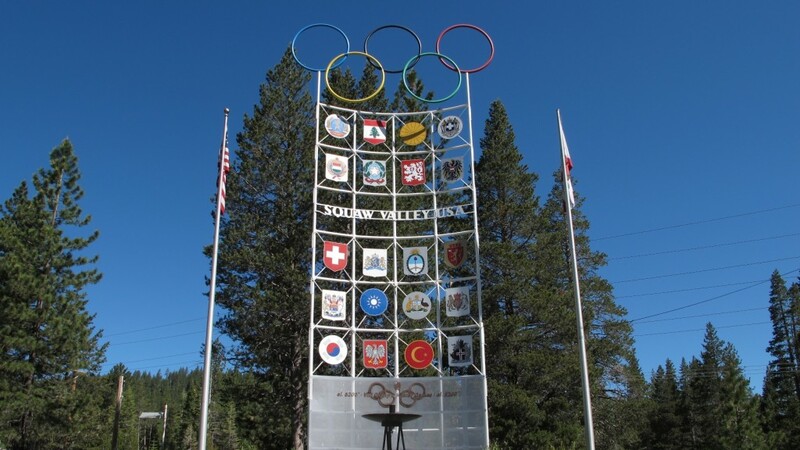 Access from Truckee is at the entrance to Squaw Valley, where the 1960 Olympic torch still burns. From Truckee (start at Squaw Valley Park): Drive south on Highway 89 from Truckee for 10 miles. Turn right at the light onto Squaw Valley Rd. Immediately turn left into the ample parking for Squaw Valley Park. Restrooms and drinking water are available when the park is open. The park is closed for the winter. Access the path by crossing Highway 89 at the traffic light, then head south toward Tahoe City. From Tahoe City (start in Tahoe City): Park at the “64-Acres Park,” just south of the Tahoe City “Y” (intersection of Highways 89 & 28) on the west side of Highway 28. Take the pedestrian bridge across the Truckee River and proceed on the paved bike path toward Squaw Valley. 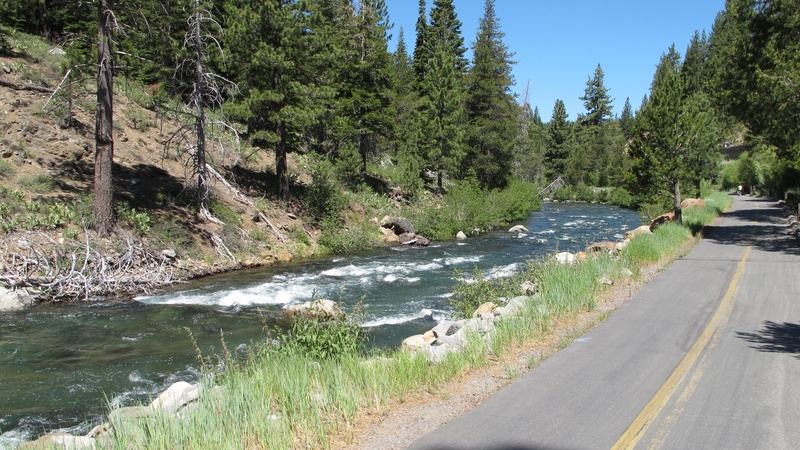 Enjoy the sights and sounds of the Truckee River from the paved bike path between Squaw Valley and Tahoe City. Click here for an interactive map and GPS data for the Squaw Valley to Tahoe City: Out-and-Back route. Run out-and-back for a 10-mile run on reasonably flat pavement. Although the trail dips and rises for the various bridges and underpasses, it is arguably the flattest pavement available for running in North Lake Tahoe. If you start at the north (Squaw Valley Park) side, then you will be running up-river first. The incline is minimal, but enough that you will enjoy the subtle descent on the way back. This is a multi-use trail designed for both transportation and recreation. Please follow the rules, which are very specific and a bit unusual: RUN ON THE LEFT and YIELD TO WHEELS. This system does take a little getting accustomed to, but it does work if everyone does their best. The trail is very popular and busy during the summer months. Get out early! Be especially careful when you reach Alpine Meadows Rd. and River Ranch, where river rafters are moving about and the trail crosses the River Ranch parking lot. (Consider returning here for lunch and people-watching on the deck.) This area is about 1.3 south of Squaw Valley Rd or 3.5 miles north of Tahoe City. Porta-potties dot the trail when it is officially open. The trail “closes” for the winter months and is not plowed or maintained. The shady sections are especially prone to black ice in the late Fall. The Tahoe City PUD does a nice job of clearing and sweeping the pavement in the spring once it is re-opened. Enjoy spectacular Lake Tahoe views, then turn around at Tahoe Pines to complete your 20-mile out-and-back run. The path ends just a bit south of Tahoe Pines. Ward Creek: Need to add a climb to your lakeside run? Take Pineland Dr west up to Ward Creek Blvd. In the past I have included this climb as part of my Lake Tahoe Marathon training. Click here for an interactive map and GPS data for an 18-miler including the west shore bike path and Ward Creek Blvd. Squaw Valley USA: From Squaw Valley Park, continue uphill on the paved path about 2 miles to Squaw Valley USA. Tahoe City: Connect to the new Tahoe City Lakeside Trail. 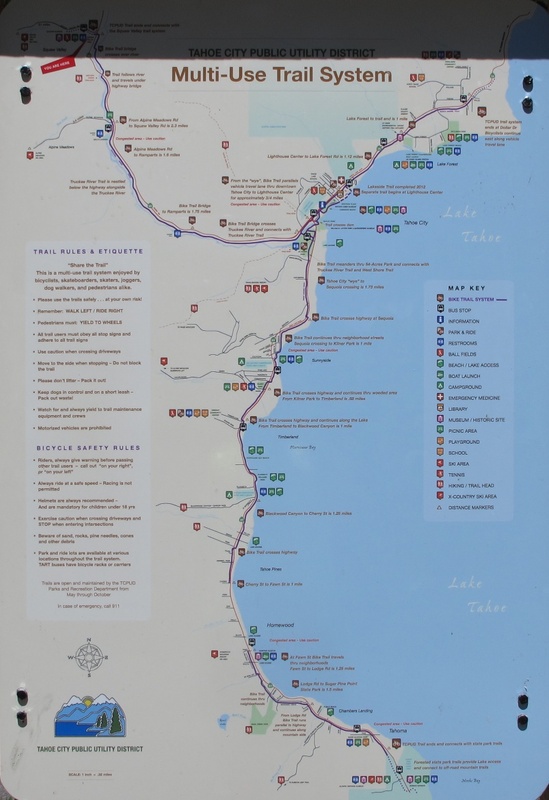 Trail-side map of Lake Tahoe’s West Shore bike path system. Great preview of the 2013 Ironman Lake Tahoe run course! I’ve been on this trail once or twice and it strikes me as too narrow for an Ironman run. I hope they will be very careful about where the aid stations go – people tend to stack up for the buffet. Thanks for the note! I have run two marathons with large portions on similar paved bike paths (Vernonia Marathon & Reno Rock-n-River), and it is surprisingly comfortable. Granted, these are both small races. Hopefully all goes well with the Lake Tahoe Ironman – so exciting to have it here in Tahoe!